Every animal on the coral reef is frightened by the news: “A sea dragon is coming!” Even Shark, Eel, and Octopus flee, but Sea Horse’s best friend, Coral, is attached to the reef. Coral cannot leave, but she is not afraid for herself. She is worried about Sea Horse. Brave Sea Horse stays behind to protect Coral from the monstrous beast, but when the dragon finally arrives, Sea Horse discovers that sea dragons aren’t so terrible after all. Intricate illustrations compliment fun facts about sea horses and their relatives: leafy, weedy, and ribboned sea dragons. Hardcover, $17.00, Publication Date: June 1, 2011. Softcover, $7.99, Publication Date: September 1, 2011. Winner in the Picture Book category of the 2011 Next Generation Indie Book Awards (sponsored by Independent Book Publishing Professionals Group www.ibppg.com). Read my blog post. Finalist in the Picture Book (hardcover fiction) category of the USA “Best Books 2011” Awards (sponsored by USA Book News). Second Place in the “Children – Early Reader (6 to 8)” category of the 2011 Reader Views Literary Awards. Read my blog post about the award. 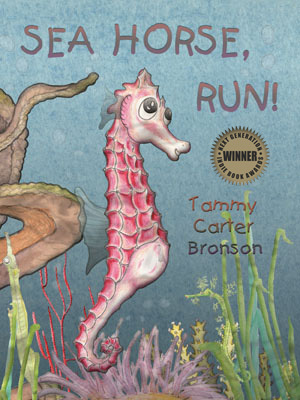 VIDEOS: Listen and watch as Tammy’s reads her award-winning fourth picture book!